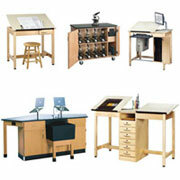 PCFurnitureStore.com - Computer & LAN Furniture, Classroom, Library & Early Learning Furniture, Training Tables and AV Carts. If at any time you have a question we encourage you to call us at 888-651-3880. 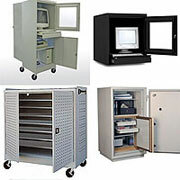 Sandusky Cabinets, Edsal, Luxor, Da-Lite and FireKing take care of our Computer Security Cabinets, Laptop Security Carts and Media Storage Cabinets. 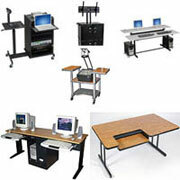 Training Tables and Classroom Furniture, AV Carts including TV Carts, LCD Carts, TV Cabinets, Overhead Carts and Lecterns are brought to you by Balt, Luxor, Correll, Diversified Woodcrafts, Royal Seating and H.WIlson. Recently we've added complete lines of Office Chairs, Classroom Seating solutions and a nice selection of Folding Chairs and Stackable Tables from Balt, Royal Seating and Correll. 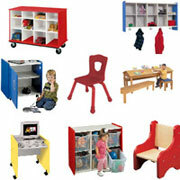 If you require Early Learning Furniture you'll find those solutions from Balt, Stevens Inds. (Tot Mate) Royal Seating & Luxor here too. Working closely with reputable manufacturers allows us to negotiate great deals on all computer furniture and accessories. And now we're passing those savings on to you. In fact, we challenge you to find a lower price on our computer desks and tables. Show us the competing computer furniture price and we'll do our best to beat it—it's that simple. You'll save time and money when you shop PCFurnitureStore.com. 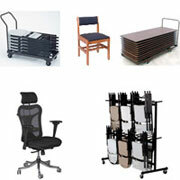 Specializing in computer furniture allows our team to offer quality advice. From classroom computer desks to training facilities and computer labs, and from home offices to large corporations, the PCFurnitureStore team will help you get set up with the perfect computer furniture for your needs. Great service, great prices and top-quality computer furniture—PCFurnitureStore.com has it all! Order Your Computer Furniture Today! Have questions about computer desks, tables or other computer furniture? Email our friendly, knowledgeable staff now, or call toll-free: 888-651-3880 (216-373-4200 outside the continental US). 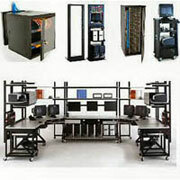 We offer THE BEST pricing for Computer Furniture on the NET. If you find a better price on any of the computer furniture listed here contact us and we will do our best to beat that published price.